There is an outside chance that a newly discovered comet might be on a collision course with Mars. Astronomers are still determining the trajectory of the comet, named C/2013 A1 (Siding Spring), but at the very least, it is going to come fairly close to the Red Planet in October of 2014. "Even if it doesn’t impact, it will look pretty good from Earth, and spectacular from Mars, probably a magnitude -4 comet as seen from Mars' surface," Australian amateur astronomer Ian Musgrave wrote. The comet was discovered in the beginning of 2013 by comet-hunter Robert McNaught at the Siding Spring Observatory in New South Wales, Australia. According to a discussion on the IceInSpace amateur astronomy forum, when the discovery was initially made, astronomers at the Catalina Sky Survey in Arizona looked back over their observations to find "pre-recovery" images of the comet dating back to Dec. 8, 2012. These observations placed the orbital trajectory of comet C/2013 A1 right through Mars orbit on Oct. 19, 2014. However, after 74 days of observations, comet specialist Leonid Elenin notes that current calculations put the closest approach of the comet at a distance of 67,853 miles (109,200 kilometers), or 0.00073 AU from Mars in October 2014. That close pass has many wondering if any of the Mars orbiters might be able to acquire high-resolution images of the comet as it passes by. But as Ian O’Neill from Discovery Space points out, since the comet has only been observed for 74 days (so far), so it’s difficult for astronomers to forecast precisely where the comet will be 20 months from now. "Comet C/2013 A1 may fly past at a very safe distance of 0.008 AU (650,000 miles)," O'Neill wrote, "but to the other extreme, its orbital pass could put Mars directly in its path. At time of Mars close approach (or impact), the comet will be barreling along at a breakneck speed of 35 miles per second (126,000 miles per hour)." Elenin said that since C/2013 A1 is a hyperbolic comet and moves in a retrograde orbit, its velocity with respect to the planet will be very high, approximately 56 kilometers per second (126,000 mph). "With the current estimate of the absolute magnitude of the nucleus M2 = 10.3, which might indicate the diameter up to 50 kilometers [30 miles], the energy of impact might reach the equivalent of staggering 2×10^10 megatons!" While the massive Comet Shoemaker–Levy 9 (9.3 miles or 15 kilometers in diameter) that crashed into Jupiter in 1994 was spectacular as seen from Earth orbit by the Hubble Space Telescope, the sight of C/2013 A1 slamming into Mars would be off the charts. 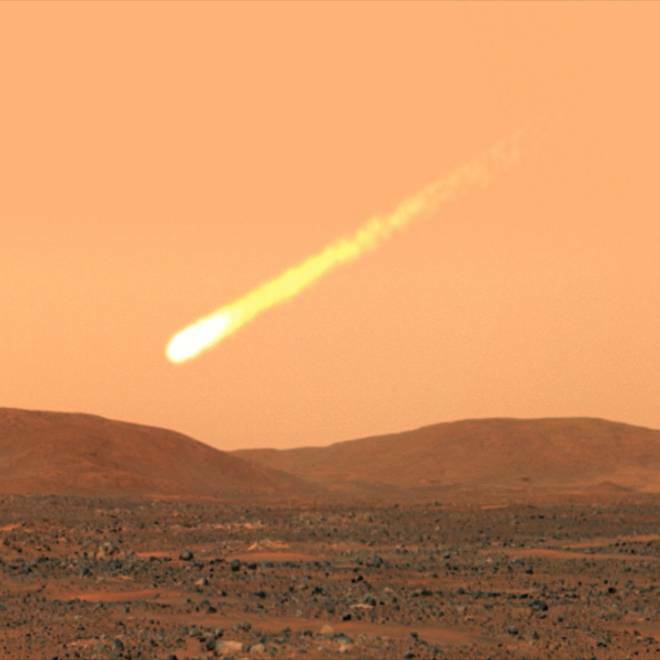 This report originally appeared on the Universe Today website as "Is a Comet on a Collision Course With Mars?" Copyright 2013 Universe Today. Reprinted with permission.